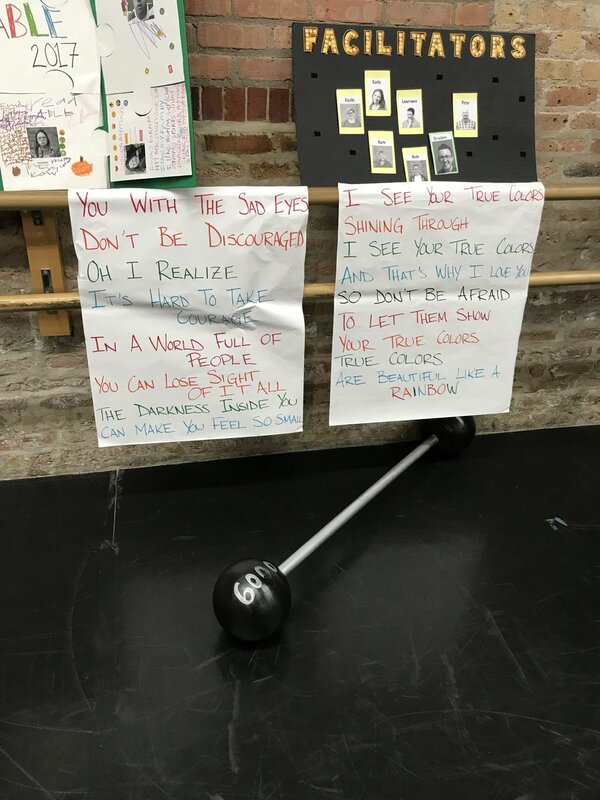 Rehearsal Log: Week 8 — A.B.L.E. It's down to the wire with only a few weeks left till our big show on December 2nd! This week, our ensembles focused on blocking, and worked out some of the trickier moments we'll have onstage. Before rehearsals, our teaching team spent some time taping the floor to help with stage directions and also setting up chairs and prop tables like we'll have backstage at the performance. It's important for these final rehearsals to feel as real as possible so that our actors are comfortable when we move into the theatre. Once our actors arrives, we kicked things off as always with a dance party. We were inspired by our workshops with Frantic Assembly (more about this on Monday's blog) to do a lot of partner movement and some big dynamic warmups. After check in, we played Stage Manager Says. 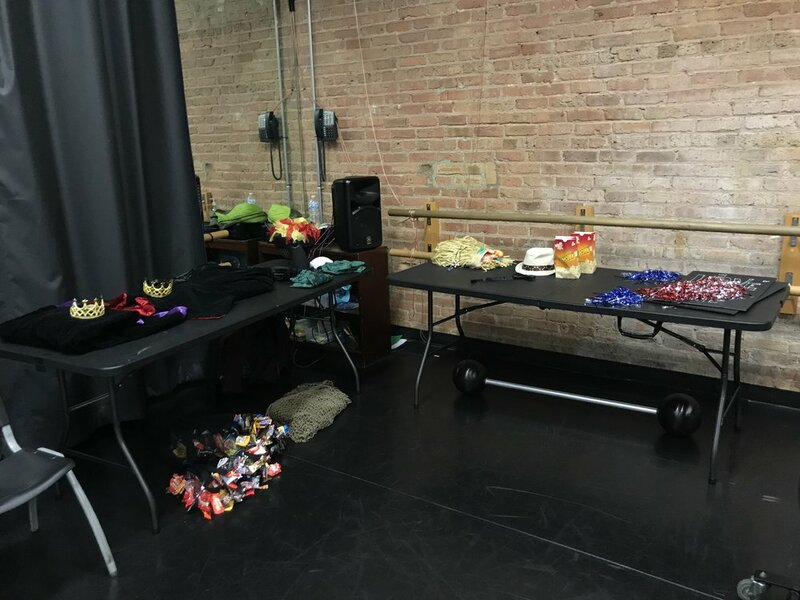 Stage Manager Says is a fun ensemble game that helps us practice our listening skills, encourages us to move and respond quickly, and also is a practical way to review stage directions. It works much like the game Simon Says - except as everyone in the theatre knows, the Stage Manager is the one who really calls the shots! Our Stage Manager can request individuals or groups of people to move to different areas of the stage (e.g. "Stage Manager says all the boys upstage! Stage Manager Says Everyone wearing glasses stage downstage left! Stage Manager Says everyone with laces on their shoes stage right!" But of course...you have to be listening and make sure you only move when the stage manager says! With these Stage Directions fresh in our brains, we moved on to some blocking. The Friday ensemble has some complicated moments in their stories including a battle between an evil villain and some wizards, a Hollywood red carpet, and a transatlantic bus journey so we focused on really clarifying those moments and making sure everyone knows where to go when. The Monday ensemble chose to run through their scenes and stop and start as needed to touch on more complicated moments. Both groups had a chance to practice their big ensemble dance parties and our sign language for True Colors. Each ensemble has just one more rehearsal before our dress rehearsal in the theatre. We'll add props and costumes and try to do a full run-through of the show to put us in good shape before Thanksgiving break. Stay tuned for more information about our final rehearsals, and make sure you book your seats to see our performance Saturday December 2 at 1pm!